One of the most celebrated lenses in NIKKOR's 80-year heritage is the 85mm f/1.4, often praised as the ultimate portrait lens. Now that same medium telephoto angle of view and outstanding performance is available for your Nikon 1 system—with an even faster f/1.2 maximum aperture. The 1 NIKKOR 32mm f/1.2 (86mm equivalent on Nikon 1's CX format) combines exceptional optics with lens technologies usually reserved for D-SLR lenses, like Nano Crystal Coat for preventing lens flare (even in direct light) and the innovative Silent Wave Motor (SWM) for ultra-fast, ultra-quiet autofocusing. The 1 NIKKOR 32mm f/1.2 even includes a manual focus ring—another first for a 1 NIKKOR lens. Whether you're shooting portraits, travel, landscapes or HD videos, the 1 NIKKOR 32mm f/1.2 brings exciting new capabilities to your Nikon 1 system. 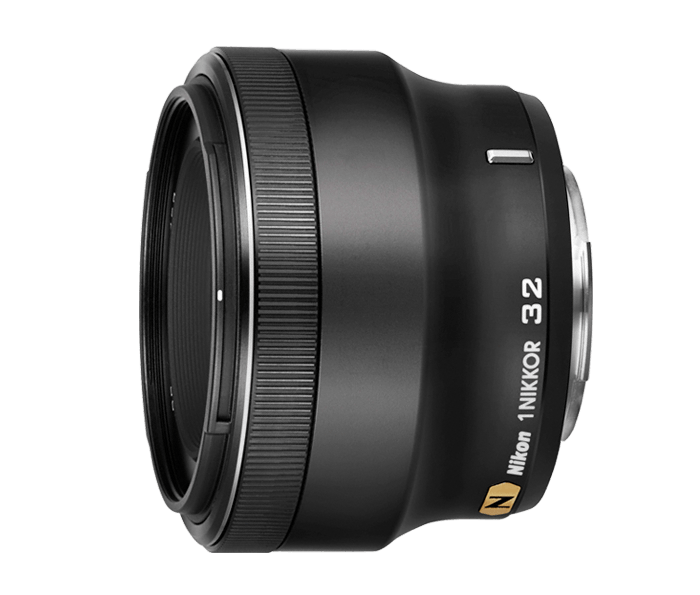 With an f/1.2 maximum aperture, the 1 NIKKOR 32mm f/1.2 is the fastest 1 NIKKOR lens yet. What does that speed mean for you? It means you can freeze action in its tracks with faster shutter speeds. It means you can shoot bright, blur-free photos in low-light situations, and it means you can shoot professional-looking portraits and videos with beautiful, softly blurred backgrounds (shallow depth of field). Simply put: a fast lens like the 1 NIKKOR 32mm f/1.2 makes it easier to bring home brilliant photos and videos, even in challenging shooting situations. The 1 NIKKOR 32mm f/1.2 boosts the performance of your Nikon 1 with some of Nikon's most advanced lens technologies. For faster, quieter autofocusing, it has Silent Wave Motor (SWM), a remarkable innovation that uses ultrasonic waves—instead of a gear system—to focus the lens. This brings even greater speed to your Nikon 1's ultra-fast autofocus system, and its near-silent operation and manual focus control ring are major advantages when recording HD video. Nano Crystal Coat (N) virtually eliminates lens flare and reflections, even when shooting in bright sunlight. Like all 1 NIKKOR lenses, the 1 NIKKOR 32mm f/1.2 is impeccably designed. Compact and lightweight, it features a high-quality metallic exterior that complements your Nikon 1 camera. Pair it with the 1 NIKKOR 18.5mm f/1.8—another very fast lens—for an outstanding fast compact system. Or pair it with the 1 NIKKOR 10-100mm VR all-in-one lens for a streamlined travel system. However you use the 1 NIKKOR 32mm f/1.2, you'll always be glad you have the low-light, high-speed shooting capabilities it offers.